Yesterday I had to take my car into the dealer for some warranty work. They said they would need the car all day and since it was a 110 mile drive to the dealer I said I wanted a courtesy car so I could at least go do something. They agreed. I'd like to state that the auto dealer did a very good job on the work and I am very happy with their response. 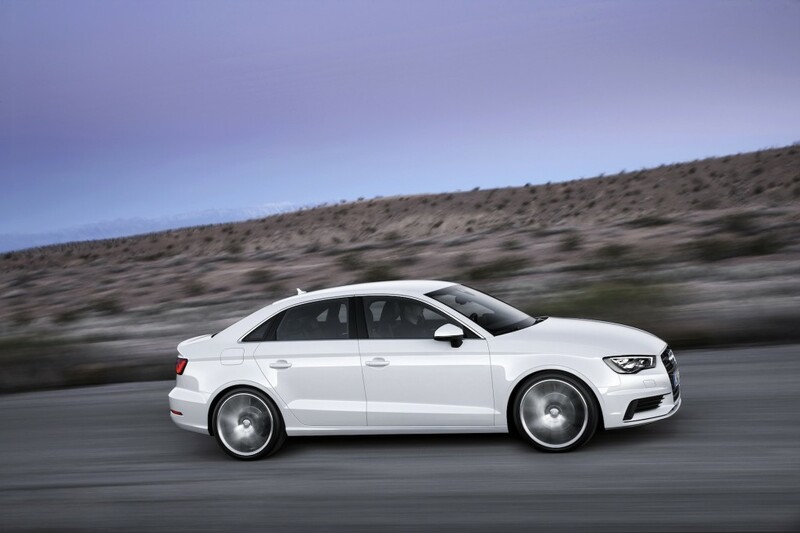 But the courtesy car they gave me was a 2015 Audi A3 sedan. Yes, a 2015 model, just introduced into the US. According to Car and Driver (my source for all things automotive), Audi is hoping to use this car to attract younger buyers who, they hope, will get in the habit of buying Audis and then when they are older and have the means, move up to an A4 or A6 rather then a BMW or Mercedes-Benz. But if this is the car that is suppose to lure young people to stick with Audi, I don't think they will be successful. First of all, I could barely get into it. Now, yes, I am a big guy. But it wasn't my size that seemed to be the issue but my height. I put the seat all the way down and still my head hit the top of the door frame. I had to sort of wedge myself in, making sure my head was as close to the B-pillar (the pillar between the front and back doors) as possible, and still it seemed with each entry and exit I was scraping off hair I could not spare. But that could have just been me. Once inside the car I had plenty of room and was comfortable. Driving the car was not what I would expect from a near $30,000 "near-luxury" vehicle. The 1.8L turbocharged 4-cylinder engine ran so rough I wondered if was a diesel (it wasn't, I checked the filler cap). It seriously sounded as if there was gravel in the cylinders grinding away. Engines are supposed to sound good, not like concrete mixers. The throttle response was nothing nothing nothing OMG TOO FAST! It seemed the first few inches of throttle travel gave no response then the car leapt forward as if goosed by a cattle prod. I was sure people behind me at red lights thought I was sleeping when the light turned green but I was slowly pushing down the gas pedal so the car wouldn't rear-end the car in front of me. The Continental tires were noisy, especially on concrete pavement. The trunk was small (it couldn't hold all of our Costco purchases) but, as I said, the interior was comfortable at least in the front seats. I didn't get a chance to test its handling very much due to driving mostly on crowded city streets and the engine seemed capable to pull the car to speed on the freeway if you could stand the noise it made. But if someone asked me if they should buy this car, I'd say "no" simply for the engine noise and the throttle response. Thanks for the review, Car service is necessary it increases the life of car so Audi Service is needed so that your car remain like new and engine remain in best condition. Thanks for the car review and Car Equity Calculator Portland is the best if you want to find the price of your used car. Thanks for the blog, These kind of luxurious car needs security and for that gps tracker for car is the best which will tell the location of the car. Audi car has always amazed with their feature. Get audi q5 for sale from the audinorthpark with the benefits. These reviews of the Audi car is valuable to get the affordable car services. Vehicle Recovery In Kent provides the vehicle services when you are running out of fuel and repair service is required. Thanks for the blog. This car has the great reviews. If you lost your car keys then, get your remote key fob made from Replace My Remote in the optimal price. Write, then Edit, then Edit Some More . . .